Works with any app that supports drag-and-drop, but also provides an extension for apps that don't yet support it, as well as the ability to paste items to & from the clipboard. Quickly search for items inside the app or via Spotlight. Access your top items from the home screen / Today widget, your Apple Watch, and even iMessage. Annotate items with notes, custom titles, and tag items with labels that allow you to easily categorise, browse, and sort your collection. Take your collection with you on your iPhone, and keep it updated by turning on automatic iCloud syncing. 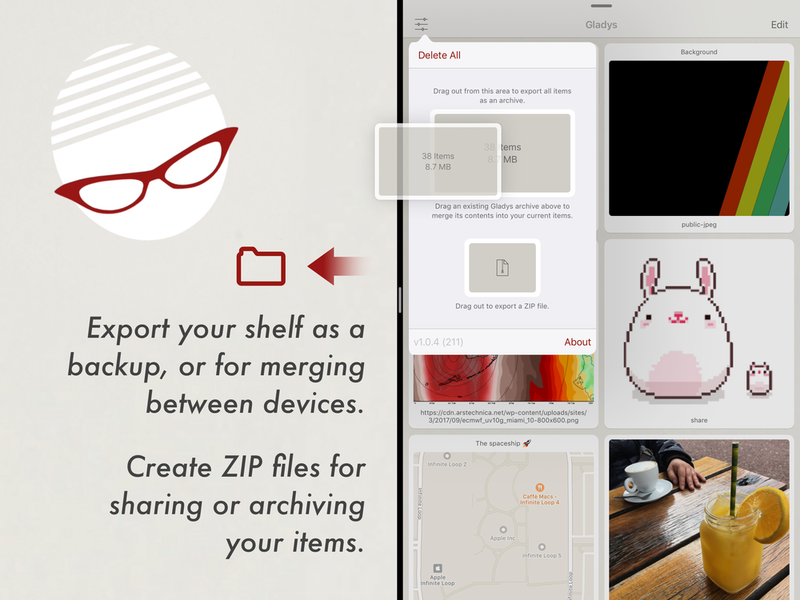 Invite friends to keep items from your own collection in their own collections, and, if you give permission, even collaboratively annotate and edit them. Import/export/merge collection archives simply by dragging. Ideal for bookmarking between apps: For example you can quickly return to dropped email items by selecting 'Open' in their info view, or quickly share links between different browsers. Experienced users can get details on dropped items and extract or modify specific data components (e.g. extract the URL of an image link, instead of the whole item, add a new image, or edit the title). 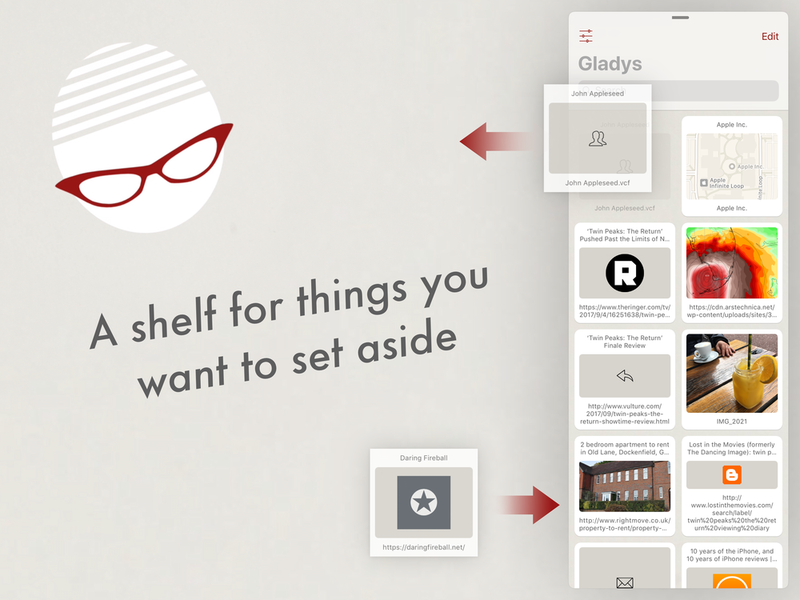 Power users can use Gladys' Files extension to view/edit items in-place from other apps, as well as exporting all items in a ZIP file for sharing. Technical users can inspect binary data using the in-built hex viewer, download items pointed to by web links, and even archive web pages. Contains no analytics, ratings prompts, or noise. Betas for iOS can be found here. Using a Mac? Gladys for macOS can be found on this page. Gladys supports the x-callback-url scheme for interoperating with other apps. For details please see here.